What is another word for amounts? equivalents, earnings, Moneys, doses, Premiums, rises. accounts, montants, implications, Grants, Resources, Subsidies, services, sumas. statement, components, compensatory, preparation, sumas, saskatchewan, consolidated, realization, numbering, financing, dollars, item, Preparing, table, clearing, wto, return, adds, debts, canadian, offset, prepare, pwif, hereby, set-off, -lsb-, value. extents, accountants, counts, Concentrations, appropriations, consignments, fractions, constitutes, limitations, statements, allotments, Investments, Endowments, transactions, commitments, conditions, mountains, duration, denominations, temperatures, assessments, complaints, matters, engagements, displacements, montants, Undertakings, estimations, consumption, assignments, portions, instalments, factors, outlays, repayments, overcapacities, quotas, contributors, estimates, Measures, developments, entitlements, billions, qualifications, substances, Movements, implications, kinds, Adjustments, shipments, subscriptions, importance, increments, purposes, tons, additions, ingredients, authorities, instruments, quantitative, Grants, reparations, reductions, representative, terms, relatively, Publications, recipients, ratios, Containing, savings, Opportunities, deviations, range, ranges, times, Remittances, reservations, differences, consequences, presupposes, Boundaries, credentials, assets, operations, corresponds, parts, details, lots, catches, tribunals, configures, statistics, limits, balances, levels, intensities, maturities, discrepancies, surfaces, collections, scale, Scales, dimensions, contracts, accomplished, elevations, bounds, increases, Budgets, winnings, inputs, individuals, obligations, differentials, establishes, exceedances, numerals, names, elements, Indemnities, data, Stations, Inventories, correlates, commissions, Students, positions, performances, Bonuses, overruns, stockpiles, instances, authors, excesses, transfers, conforms, ways, qualifying, masses, receivables, loads, payables, surplus, surpluses, envelopes, Annuities, involves, expanses, REAMS, Capacities, emissions, reserves, backgrounds, units, sections, finances, extensions, Perceptions, dozens, summarized, assumes, wages, certificates, loadings, Royalties, denotes, corresponding, Pensions, streams, attained, respectively, method, surcharges, intakes, captions, auditors, margins, Areas, inflows, withdrawals, heading, headings, summary, borrowings, criminals, averages, Salaries, touches, settings, projections, Capabilities, predictions, timelines, TONNES, items, weight, Weights, encrypts, Incentives, refunds, Resources, applications, departures, burdens, lands, rebates, strengths, accessions, doubts, expenses, variances, dosages, vouchers, profits, enclosures, fonds, kilometers, consuls, alternatives, invoices, facts, interests, traces, signifies, benefits, tiers, reduces, losses, Entries, marks, Tailings, residues, Currencies, Diplomas, flows, suspicions, Duties, deadlines, cheques, least, targets, few, Involving, mode, tracts, emitters, heights, Subsidies, accruals, kilometres, sales, deposits, source, learners, Tracks, hands, Abilities, degree, degrees, batches, sommes, caches, findings, returns, features, full, zones, forecasts, samples, achieves, Supplied, Activities, stands, tools, games, shares, demands, uses, imports, mappings, objects, pools, planned, Forms, studs, definitive, cifras, km, words, parcels, caps, stretches, housings, products, fines, releases, renders, VOLS, grades, creditors, Whether, scores, supplies, skills, debtors, Maps, reflects, gaps, types, implies, shall, triggers, gifts, Entities, advances, checks, sets, displays, places, Schedules, aids, fluxes, Ones, plots, Tablets, slices, party, bands, periods, headlines, Rights, honors, VOTES, Bodies, users, Facilities, Charges, Pupils, who, title, titles, digits, holdings, stocks, yields, woods, references, arrivals, frameworks, crowds, Copies, Gains, reaches, Has, juices, struts, Genera, CREWS, stores, deeds, awards, Levies, trips, approaches, metres, jumps, access, services, east, Las, Prices, Miles, pillars, cases, bills, offers, blocks, exports, hordes, members, shells, mergers, provides, servings, Remedies, seas, posts, sheets, genres, accords, Recipes, Seizures, brackets, Rivers, Shown, Securities, recoveries, Recalls, footsteps, uprights, drawings, components, spells, looks, Shots, DUES, falls, guide, rods, est, shifts, deals, pills, RIOS, books, requests, Strikes, shows, less, views, paragraphs, Does, ec, meets, cuts, slips, is, Pens, drops, S, name, i, makes, LINEs, 's, dollars, table, debts, offset. committed, come, Came, Compared, earned, received, Went, re, Got. contains, counts, generates, contributes, approximates, encompasses, constitutes, limitations, determines, equals, notes, indicates, beneficiary, presents, equates, summarises, portrays, matters, correspond, stipulates, pertains, exists, consists, detail, suggests, concludes, informs, reports, decreases, illustrates, entail, Entailed, entails, summarizes, attains, transcends, aims, matches, comprises, identifies, introduces, Comes, remains, turns, describes, opens, converts, considers, recommends, coincides, translates, imposes, occurs, accrues, supposes, qualifies, signals, follows, enables, representative, creates, promotes, ends, Violates, results, responds, resembles, allows, includes, Leaves, runs, tells, becomes, concerns, boosts, presupposes, Boundaries, spending, corresponds, belongs, details, endorses, puts, infringes, says, causes, elevates, limits, balances, relates, valuable, observes, parallels, ensures, presumes, works, leads, exceeds, REPS, embodies, deal, bounds, prepares, deserves, increases, requires, arrives, sends, means, hits, breaks, Affects, extends, des, agrees, establishes, poses, helps, correlates, calls, recurs, egypt, draws, Carries, conforms, depicts, brings, involves, Plays, goes, passes, fits, Rests, appears, covers, reverts, assumes, feels, Bears, Les, 400, denotes, lodges, declines, resides, lifts, takes, applies, seeks, sees, arises, expires, encrypts, refers, lies, cares, dates, holds, expenses, fonds, signifies, keeps, benefits, reduces, marks, serves, flows, Met, raises, ai, Gives, sommes, returns, acts, stands, imports, planned, Forms, renders, implies, sets, displays, places, Charges, gets, reaches, Has, struts, approaches, jumps, Las, offers, provides, accords, Recalls, looks, falls, shifts, deals, Strikes, shows, Does, meets, rises, is, S, makes, 's, adds, value. 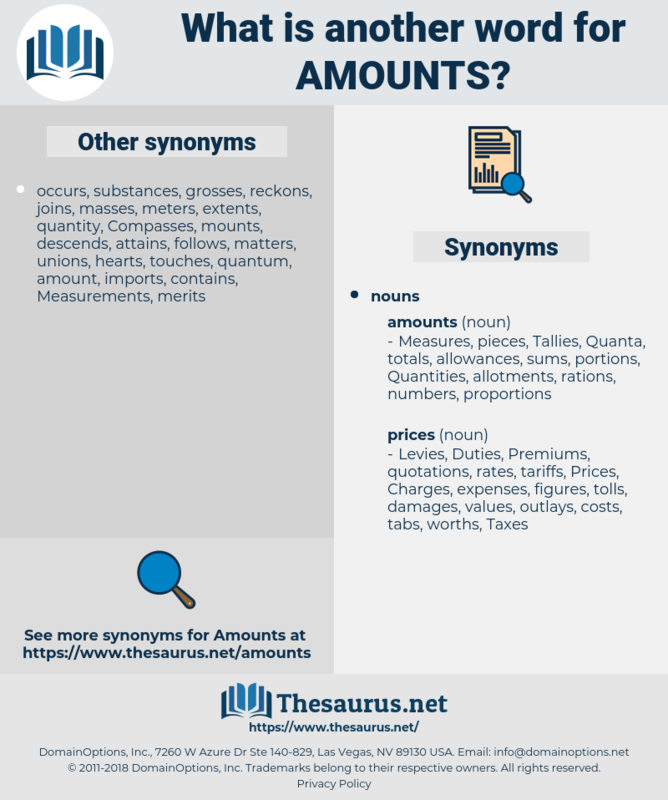 compensation, quantity, Quantities, declaration, sum, sums. 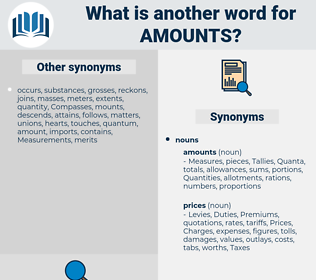 accounts, accumulations, proportions, reimbursements, disbursements, totals, installments, compensations, percentages, calculations, determinations, allocations, donations, distributions, volumes, thresholds, contents, deductions, allowances, tranches, means, revenues, loans, Taxes, ceilings, needs, Quantities, declaration. equivalent, accounts, totals, estimates, food, breeds, achieves, reflects, needs, quantity, Quantities, sums. I don't myself, because I've got what amounts to a job here. In fact it amounts to the same thing on a larger scale. amenity, and how, amity, anatidae, animate, ante, antedate, animated, annamite, ament, amati, amiidae, ammonite, amended, amend, amentia, aunt, annuity, anode, amide, ammodytidae, ammoniate, annotate, antido, amanita, ammonoid, anomiidae, anhimidae, aunty, anti, awned, auntie, annoyed, amniota, animated oat, anonymity, antidote, amniote, ant, ammoniated, aeneid, anoint, Anne Hathaway.